The Sabres seem to have plenty of bad luck in the injury department. Not just this season, but nearly every season. A few years ago, they made it to game seven of the conference finals, but most likely lost because they had one starting defenseman who was healthy! Many of the defensemen have missed time this season also. 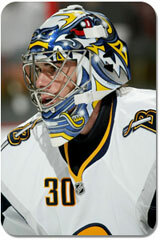 2009 has been pretty much the same story, including the most recent injury to all-star goalie, Ryan Miller. In Saturday’s victory over the Rangers, the Sabres lost Miller to a high ankle sprain. Those are bad. They usually place football players on the season-ending IR. They involve at least weeks of recovery, sometimes months. That’s bad. Miller is arguably the Sabres’ best player. And if some might give that title to Thomas Vanek, well, he’s gone too. The Sabres’ best news this season has been the huge contribution from Tim Connolly, who it seems has been injured for more than two thirds of every season he’s been in the league! (Including this one.) He has become the star the Sabres hoped he would be since returning from his injuries this season. Sabres.com posted an article about the injured Sabres, including an encouraging update: Thomas Vanek is skating again in practice. He was not expected back this early. Max Afinogenov and Andrew Peters are also currently recovering from injuries. It’s definitely not good when you are clinging to eighth place in the conference – the final playoff spot – and you lose your top two players. The Sabres are likely thinking about making some trades before the trade deadline on March 4th. Maybe a veteran goalie, maybe another forward… who knows. While Connolly, Derek Roy, Jason Pominville, Drew Stafford, and a few others have had pretty good seasons, it’s hard to recover from losing your best two players. Perhaps a trade or two can give the Sabres what they need to make the playoffs, get their stars back, and make a run of it. Perhaps. The playoffs are always more fun when your team is in it. We’ll see if the 2009 playoffs will be “fun”.